National Taco Day is coming up on Thursday, October 4, 2018 and a number of taco-serving fast food chains hope to help you celebrate with a taco deal or freebie. - Cold Stone Creamery - October 4, 2018 - They're serving ice cream waffle tacos, which is basically a fancy Choco Taco. - Del Taco (coupon required) - October 4, 2018 only - Buy one, get one free Shredded Beef Soft Taco. - El Pollo Loco (coupon required) - October 4, 2018 only - Free Chicken Taco al Carbon with any regular-priced food or drink purchase. - Fuzzy's Taco Shop - October 4, 2018 only - $1 tacos all day. - Jimboy's Tacos - October 4, 2018 only - Buy one ground beef taco, get one free. 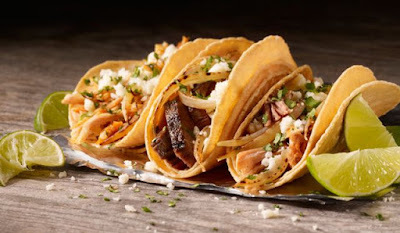 - On the Border Mexican Grill & Cantina (dine-in only) - October 4, 2018 only - All-you-can-eat tacos for $8.99 (also include rice, beans, chips, and salsa). - Rubio's (coupon required) - October 4, 2018 only - Free Original Fish Taco with any beverage purchase. - Taco Bell - October 4, 2018 only - $5 National Taco Day Gift Set, which includes a crunchy taco, a Nacho Cheese Doritos Locos Taco, Cool Ranch Doritos Locos Taco, and Fiery Doritos Locos Taco. - Taco Bueno - October 4, 2018 only - Free Texas Street Taco with any purchase. - Taco John's (mobile app required) - Every day this week through October 5, 2018 - Free Crispy Beef Taco (they're calling the promotion "National Taco Week").